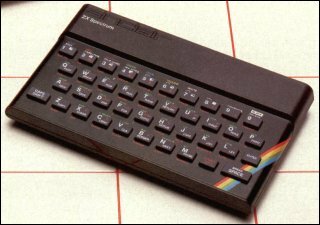 The legendary rubber-keyed ZX Spectrum was for many millions of Britons their first introduction to computing. Originally released in April 1982, it had been designed (under the working name of "ZX82") with the same philosophy in mind as with the ZX81 - namely, to be the cheapest colour home computer on the market. The hardware was designed by Richard Altwasser of Sinclair Research, while the software was written by Steve Vickers (who subsequently wrote the Spectrum manual), on contract from Nine Tiles Ltd, the authors of Sinclair BASIC. The famous keyboard owed its looks to Sinclair's industrial designer Rick Dickinson, who also designed the cases of the ZX81 and ZX80. Although the outward appearance of the Spectrum remained consistent until late 1984, its hardware went through a number of changes - see the Spectrum Versions page for details. The machine was a considerable advance on the ZX81. It had a larger memory; it had colour (hence the name, Spectrum); it had sound, albeit a tinny loudspeaker capable of little more than bleeps. Originally, it was also proposed that the Spectrum would incorporate a flat-screen display based either on the technology that would eventually be used in the TV80 pocket television, or some kind of LED matrix. The Spectrum might have had better sound, too, with a proper loudspeaker built into the case rather than the rudimentary capability actually provided. Both of these features were eventually dropped on the grounds of cost. Remarkably, prototypes still exist of the Spectrum's pre-production designs and can be found in the International Vintage Electronics Museum of Brighton resident Enrico Tedeschi. They provide a unique insight into how the Spectrum design was developed by Rick Dickinson and his team. Although they often look convincingly real, they did not actually work and were never intended to, being essayed in wood and epoxy to work out the visual appearance and ergonomics of the proposed designs. (This was a standard tactic for Sinclair - mockups were often used in publicity photographs and advertising, sometimes well before the real thing was ready for the market.) The designs share a clear genetic resemblance, eventually converging on the final version. The rubber keyboard is present in all, although in a rather different form - for instance, with a large central space bar on the bottom row, as per a typewriter keyboard. More radical variants have a tiny flat screen display in the upper part of the case, or a long thin LCD-type display extending across most of the raised black strip above the keyboard. All of the designs have about the same physical dimensions, illustrating the physical constraints to which Dickinson had to conform. The Spectrum was always intended to be a compact computer, inevitably bigger than the less sophisticated ZX81 but still very much smaller than the offerings from Sinclair's main rival, Acorn. Acorn's answer to the Spectrum was the BBC Micro, a much larger machine with a proper "full-travel" keyboard. It also had far better graphics and sound than the Spectrum. This made for distinctly critical comparisons from reviewers, who rightly pointed out the Spectrum's slowness and graphical limitations. The Spectrum's 256x192 pixel resolution was actually rather better than most of its competitors and came with a choice of eight colours (arguably fifteen with the use of the BRIGHT attribute), but the catch was that you could only use two colours per 8x8 pixel square. This caused the infamous "colour clash" problem. Clever graphic design could minimise this, as seen on the right in Ultimate's Jet Pac (1983), but it could still produce some garishly ugly results (notice the blocky multicoloured fireballs on the right of the screen shot). There was also an irritating "dot crawl" effect resulting from problems in the graphics circuitry; no amount of cleverness could resolve this, so Sinclair users had to put up with it until Sinclair itself resolved the problem with the 1984 Spectrum+. These problems were an inevitable result of Sinclair's design brief, which emphasised low cost and simplicity at the expense of technological sophistication. But these compromises were also at the heart of the Spectrum's success, as its affordable and uncomplicated nature made it the ideal computer to crack the home market. The Spectrum was initially released in two versions, outwardly identical - a 16K machine for £125 and a 48K version for £175. The 16K version was rapidly superseded by its more capable big brother - it could be upgraded using a kit available from Sinclair - and by the end of 1982 the market had already swung heavily in favour of the 48K Spectrum. Production of the Spectrum started at 20,000 a month, with 300,000-400,000 machines expected to sell in the first year. Unfortunately it did not work out quite like that. Demand was enormous, far ahead of supply, and the first machines did not reach the market until June 1982. By July 1982, Sinclair already had a backlog of 30,000 orders. The situation worsened through the summer, with delivery delays of three months becoming commonplace. In October the company was severely rebuked by the Advertising Standards Authority for failing to meet its promise of "28-day delivery". The Spectrum was also very popular abroad, with the unfortunate result (for Sinclair) of numerous pirate clones of the machine being produced. Ironically, these clones have outlasted the Spectrum itself and have ensured the Spectrum's survival (albeit in a greatly modified form) for well over a decade longer than the original machine. Two authorised clones of the Spectrum were also produced by Timex Inc. of the United States, although these met with little success. Sinclair responded to the surge in demand by ramping up the production of the Spectrum. The delivery problems were eventually resolved, and by March 1983 more than 200,000 Spectrums had been sold by mail order, earning Sinclair Research nearly £55 million. Sales figures continued to increase as major High Street stores such as W.H. Smith, Boots, Curry's and Menzies got in on the booming market. Soon up to 15,000 Spectrums were being sold every week in the UK, doubtless assisted by the price of the 48K model being reduced to £129.95. A major reason for the huge popularity of the Spectrum was the enormous range of software available for it. The ZX81 had spawned a huge cottage industry of computer programmers, many literally working from their bedrooms or garages, and they soon moved across to the Spectrum when that machine was released. Some published their products commercially, giving rise to the Spectrum software industry, but many more did it simply to learn about programming. Few self-respecting computer magazines appeared without program listings which one could type in. This had significant long-term consequences - it fostered an enormous pool of programing talent, to this day allowing Britain to punch far above its weight in the world software market.